* In an attempt to shore up his conservative bonafides, Jeb Bush’s Right To Rise superpac used an image of Terry Schaivo in a recent ad. Understandably, her husband Michael wasn’t happy about that. * Here’s another excellent executive move by the Obama administration. The Obama administration will announce new plans Wednesday to launch a pilot program aimed at increasing poor children’s access to food through the National School Lunch Program. The pilot program will allow participating states to use Medicaid data to automatically certify students for free and reduced-price school lunches. Currently, families have to submit an application — a laborious process for parents and a costly one for schools — even when they have already proven that they are income-eligible through their participation in other government assistance programs. * At a campaign event in Iowa last night, an audience member asked Hillary Clinton if she would consider nominating Barack Obama for a position on the Supreme Court. She thought that sounded like a great idea. Interestingly enough, Steven Waldman suggested the same thing here at the Washington Monthly last spring. If Hillary Clinton wins, Obama should be her first Supreme Court appointment. It’d be good for her, and very good for progressives. Unfortunately, here’s what President Obama told Jeffrey Toobin about that. “When I got out of law school, I chose not to clerk,” he said. “Partly because I was an older student, but partly because I don’t think I have the temperament to sit in a chamber and write opinions.” But he sounded tempted by the idea. * Robert Gates, former Defense Secretary who has served under eight presidents, doesn’t think much of the Republican presidential candidate’s articulation of their foreign policy views. 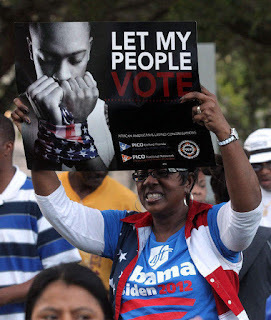 * Finally, the proliferation of voting restrictions in many states after the 2010 election inspired a backlash – especially among African Americans – in the 2012 election. Apparently the rhetoric of Donald Trump (and other Republican candidates) about immigrants is stirring up a similar backlash among Latinos. Donald Trump’s scathing rhetoric about Latin American immigrants is galvanizing a movement in the community to pursue American citizenship and register in key battleground states. In what campaigners are calling a “naturalization blitz”, workshops are being hosted across the country to facilitate Hispanic immigrants who are legal, permanent residents and will only qualify to vote in the 2016 presidential election if they upgrade their immigration status. Citizenship clinics will take place in Nevada, Colorado, Texas and California later this month, with other states expected to host classes in February and early March in order to make the citizenship deadline required to vote in November.